Anna Nechaeva falls hard for the title character in Tchaikovsky's Eugene Onegin. 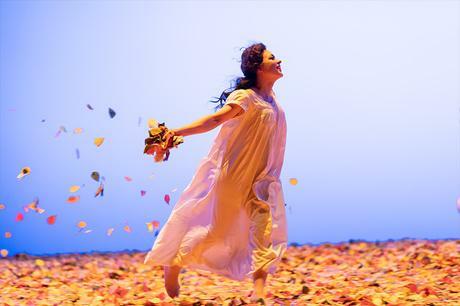 Photo courtesy the Washington National Opera and the Kennedy Center. You can take a boy out of New York City but you can’t take New York out of the boy. That aphorism seems to apply to Sunday’s matinee performance of Eugene Onegin by the Washington National Opera at the Kennedy Center. This production, the WNO’s first staging of Tchaikovsky’s opera in thirty years, uses the Robert Carsen production that premiered at the Metropolitan Opera in 1997. It is still handsome and minimalist, playing out the drama in a box of plain white wall.s the characters move through drifts of leaves, elegantly attired and perching on antique furniture in this stark landscape. Onegin represents a revolution in the history of Russian opera. It eschews historical pageantry and myth for a small, intimate story of frustrated love among the minor aristocracy. Although it starts with a country idyll, matters quickly turn dark, leading to an argument between friends that has fatal consequences. Tchaikovsky adopted his text directly from Pushkin's play, and the opera's conversational style can be a challenge to an audience, who are waiting for the flights of lyric beauty that assure this opera's place in the repertory. The cast was front-loaded with fine young Russian singers, veterans of the Bolshoi stage. First among these was baritone Igor Golovatenko in the title role. He played the character as a callow idiot, whose spurning of the love of Tatiana sparks the butter tragedy that follows. While it could be argued that he learns about love (the hard way), he winds up with nothing and no-one. His light, pliant baritone smoothed and thickened as the opera progressed, reaching full power in the final Act III confrontation with Tatiana as Onegin realizes what he has lost. Tatiana is the pivotal role in this opera, and one of the finest soprano parts in the Russian repertory. Here, the part was sung by Anna Nechaeva, a veteran of the Bolshoi stage who was making her company debut. This is a sweetish, slightly dry soprano with a lovely way of cutting into a big phrase, her Letter Scene (where Tatiana spills out her feelings by writing to Onegin) held the audience rapt has she arced smoothly into each new lyrical phrase. She sang with power and flexibility in the final act, adding a cold and regal quality to her acting in the third act but the voice lost none of its bloom. The third key character is Lensky, who goes from sidekick to murder victim after he challenges Onegin to a duel to the death. The breakdown of his friendship with Onegin was carefully played, bursting from nowhere in a blossom of angst. In “Kuda, kuda, kuda,” tenor Alexey Dolgov brought a sweet and pensive quality to the famous number, leaving the sad minor-key music with a sense of disbelief that he was about to engage in this stupid and pointless duel. Following the murder of Lensky, the opera jumps five years between the second and third acts. We see Onegin at a St. Petersburg society party, having traveled far from home to escape justice for killing his friend. He meets Tatiana, now married to the older, wealthy military veteran Gremin. In that role, bass Erik Halfvarson effectively stole the first scene of Act III, singing his aria with resonant power, presence and feeling. Mr. Halfvarson is known for playing bad guys like Hagen and the Grand Inquisitor, and he seemed to relish the opportunity to play a more sympathetic figure. The supporting cast was strong across the board. As Olga, Lindsay Ammann sang with bright tone, contrasting Ms, Nechaeva. Veteran mezzo so Elenz Zaremba and Victoria Livengood were Madame Larina and the Nurse, the latter overcoming a small illness to deliver a credible performance. The chorus, ballet and dancers carried themselves well through Tchaikovsky's waltzes, although the famous Polonaise was staged as an intermezzo between the second and third acts with stage business replacing the typical dance number.